In Anguilla, Bob and Belinda‘s restaurant Blanchard's is definitely the best in dining experiences. Enjoy a cuisine that’s both creative and sophisticated with fusion Caribbean flavours. The wine list has won awards and yet the atmosphere is as comfortable as can be. No jackets required, No pomp and circumstance. 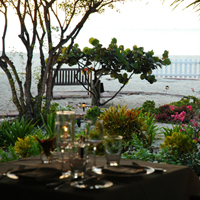 Blanchards has been hailed as one of the best restaurants in the Caribbean.